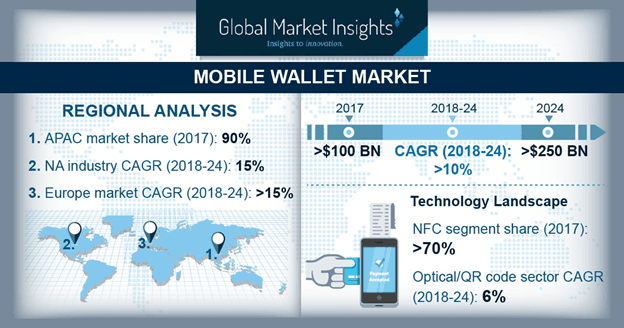 The Mobile Wallet Market is set to grow from its current market value of more than $100 billion to over $250 billion by 2024; as reported in the latest study by Global Market Insights, Inc. The mobile wallets market is propelled by attractive discounts and cashback offers by mobile wallet providers. Mobile wallet providers are enticing the customers’ by offering various attractive discounts and cashback offers. These cashback offers promote repeated purchases among customers which presents mutual benefits for customers and mobile wallet providers. Cashback offers also reduces the customer acquisition cost by preventing companies from spending large amounts on marketing their product. Changing customer behavior is fostering the growth of the mobile wallets market. Digital disruption & generational shifts are causing fundamental transformations in customer behavior that are influencing customer expectations from banking solutions. These customers, particularly the younger generation (aged between 15 to 34) are hyper-connected, digitally savvy, and more accustomed to the digital experiences provided by online retailers. The millennials prefer to partner with banking establishments that provide meaningful, contextual, and personal engagement with their customers. This is promoting the use of mobile wallets among users. 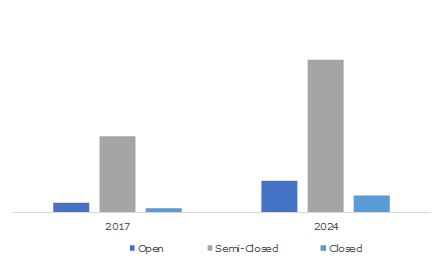 The open mobile wallets market will grow at a CAGR of over 15% over the forecast timespan. Rising investments by the financial players in mobile wallets are driving the growth of the market. Technology players and device manufacturers mostly offer semi-open mobile wallets that do not permit cash withdrawal or redemption and are applicable at select locations. Financial institutions are investing in open mobile wallets as these permit cash withdrawal & redemption and allows users to purchase products & services at various locations through a centralized mobile wallet. This is promoting the development of open wallets among traditional banks to gain an edge over its competitors. The bank’s mobile wallets market is projected to grow at a CAGR of over 15% over the projected time period. Banking establishments are investing in the development of their own mobile wallets to capitalize on opportunities to cross sell and up-sell various other financial products and gain actionable insights to provide a customized experience to their customers. The telco industry is also expected to grow at a CAGR of over 10% over the projected time period. An increasing number of partnerships between card issuers and mobile networks is fueling the growth of the mobile wallets market. The NFC technology accounts for a share of over 80% in the mobile wallets market. A high level of encryption is promoting the use of NFC technology among mobile wallet providers. NFC-enabled mobile wallets have an additional layer of security, which prevents the data from being intercepted when it is being transferred. Moreover, the growing adoption of the contact-less payment systems across retailers is also promoting the market growth. Besides, the digital-only mobile wallets market is projected to grow at a CAGR of over 11% over the forecast time period. The rising need to conduct financial transactions through remote locations has resulted in the growth of the digital-only mobile wallets market. Europe’s mobile wallets market is anticipated to grow a CAGR of over 15% over the forecast timespan. The European mobile banking landscape has evolved significantly over the last 5 years. This can be attributed to the rise of various competing mobile wallets operated by various international & domestic entities. 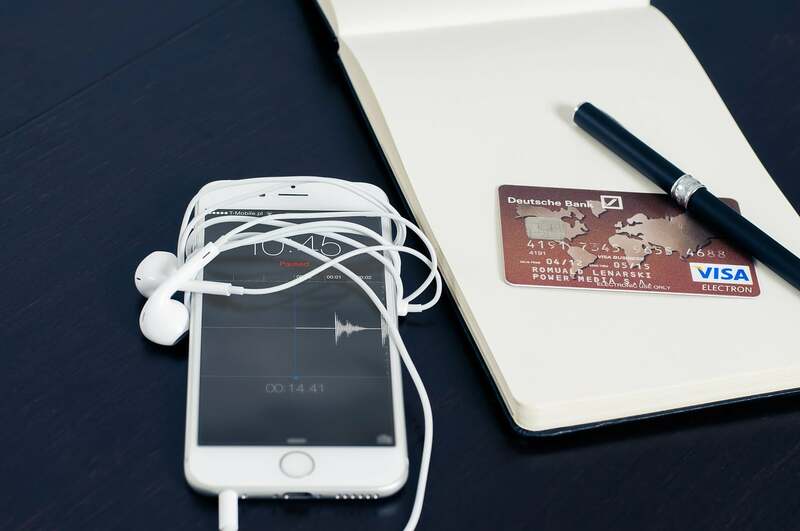 The collaborative effort between banking establishments and technology players is accelerating the growth of the mobile wallets market landscape in the region. The widespread adoption of NFC technology across the retail industry is promoting the use of mobile wallets among merchants across the region. Key vendors of the mobile wallets market are Apple, Samsung, Amazon, Tencent, Google, Skrill, American Express, One97 Communications Limited, Vodafone, Ant Financial, JP Morgan Chase, PayPal, Sprint Corporation, Visa, Well Fargo, First Data, AT&T, and Mastercard. The players in the mobile wallets market are forming strategic alliances with financial institutions, retailers, card network providers, and telecoms service providers to expand their customer base and gain market share. For instance, in July 2018, Visa partnered with Kuwait Finance House to launch a mobile wallet for credit card and prepaid cardholders.